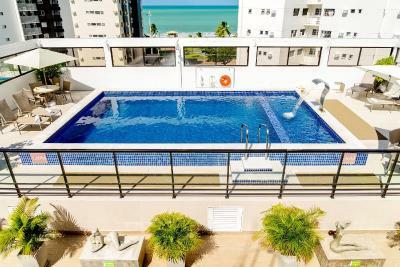 Lock in a great price for Hotel Manibu Recife – rated 8.1 by recent guests! The staff is friendly, the breakfast buffet is very nice, so is the location. As always I appreciate the value for the money. Nice hotel in Boa Viagem, next to the beach and few good restaurants. It is rather a hotel for a short business trip than a holiday. The room was pretty dark with a view to a devastated parcel with two hungry and poor dogs, that were barking all the time. Breakfast is very good. Pool would be nice if there would be no renovation. The renovation was starting at 7am until 6pm just above our ceiling. Great room, great food and very clean hotel. The pool area was great. Porters and cleaning staff very nice. Really tasty and diverse breakfast with regional specialities and fresh juices was an absolute Highlight. Great, professional staff. Really nice swimming pool and great interior design. Real 4 stars hotel! We got the room on first floor and the air conditioning machine were right outside, making sound all night long. The view of the room was awful. No view really, just air conditioning machines and a wall... we ask for a change, and the second stay was better. But Breakfast is really poor, and the aisles very dark... if you are just passing by, is ok. But I wouldn't be more thatn one night and on the Green side and upper floors. Boa localização, café da manhã, camas, wifi e equipe. Quartos e banheiros amplos, novos e bem limpos. A estrutura em geral do hotel é muito boa. Bem localizado e de fácil acesso. Localidade boa , cafe gostoso, funcionários otimos ..hotel muito bom. Cortezia de chás e cafés no ap. Simpatia dis funcionários Muito boa recepção. O cardápio do restaurante, apesar de enxuto, muito saboroso. Drinks, 2 grátis. Uma linda frase de bias vindas. Uma lembrancinha do artesanato local. Se vier novamente a Recife com certeza ficarei nesse hotel. Recomendo com satisfação. 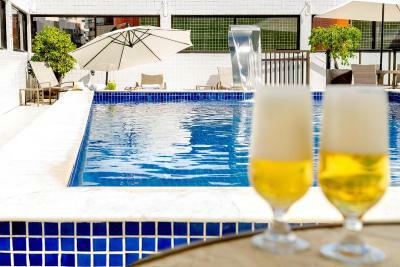 Hotel Manibu Recife This rating is a reflection of how the property compares to the industry standard when it comes to price, facilities and services available. It's based on a self-evaluation by the property. Use this rating to help choose your stay! One of our top picks in Recife.This 4-star hotel offers complete leisure and gastronomic facilities only 350 feet from Boa Viagem Beach. 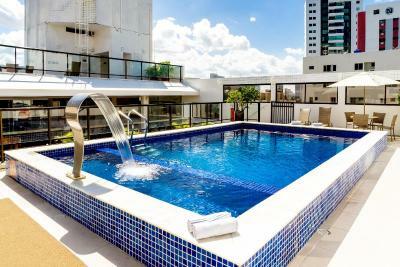 Features include a panoramic rooftop pool and cocktail bar, gym and free WiFi. 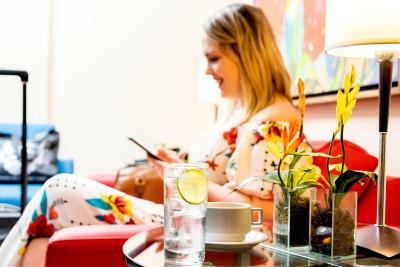 Guests at Manibu Recife can enjoy a casual glass of wine at the Crystal Lobby Bar, or a regional buffet at Pedra Bonita Restaurant, where a breakfast with fresh fruits salad is served. The spacious rooms are well-lit, featuring ceramic floors. All are equipped with air conditioning, a cable TV and a mini-bar. Recife Shopping Center is 1.9 mi from the hotel, and for leisure, Hotel Manibu Recife is 2.5 mi from Santa Isabel Theater and 3.1 mi from Recife Sports Club. Guests can also use the sauna and Turkish bath. Manibu Recife offers a convenient location 4.3 mi from Guararapes Airport. On site parking is available. When would you like to stay at Hotel Manibu Recife? This air-conditioned room features a laptop safe,a flat-screen TV, a mini-bar, goose feather pillow and a work desk. The private bathroom is fitted with a hot shower and a hairdryer. This air-conditioned room features 4 single beds, a laptop safe,a flat-screen TV, a mini-bar, goose feather pillow and a work desk. The private bathroom is fitted with a hot shower and a hairdryer. House Rules Hotel Manibu Recife takes special requests – add in the next step! Hotel Manibu Recife accepts these cards and reserves the right to temporarily hold an amount prior to arrival. Please note that rooms located on the 7th floor are only accessible by stairs. Contact property for more details. Great common area, pool etc. Renovation of the pool just above our room - as a manager I would not place anyone in the rooms directly under the pool. Excellent breakfast. Close to the beach. Man at main reception was rude, not friendly and not helpful. Such a pity as it let down the hotel. Nobody speaks english or spanish. Difficult to be understood. No ashrays available outside the hotel and on the roof terrace. breakfast. Rooms on firts floor.